With its innovative Structural Effects splitting algorithm and stunning signal processors, Fission is a brilliant plugin for both corrective and creative manipulation. Splitting Transient and Tonal is a snap. Does straight-up transient shaping, too. Only one effect per stream. Can’t route streams to separate outputs. 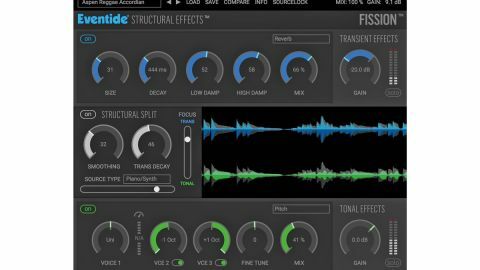 The first in what looks to be a new line from audio processing pioneer Eventide, Fission (VST/AU/AAX) is a transient design plugin that innovates in two areas: the technology used to separate the transient of the input signal from the ‘tail’, and the processing subsequently applied to both. The story behind the first of these, dubbed Structural Effects, is discussed in the box out later on in this review. As for the second, boosting, attenuating and soloing transients and tails - which are separated into two discrete audio streams, called Transient and Tonal - is only the tip of Fission’s creative iceberg. It also offers a discrete effects module for each stream, enabling, for example, the crack of a snare drum to be treated to a delay, while the body is run through a reverb, with no crossover whatsoever between the two; or for auto-panning to be worked into the decay portion of a keyboard line while the attack of the sound stays central; or retuning the sustain of a tom tom in isolation... you get the idea. Despite the complexity of the machinery running in the background, Fission’s interface is very easy to get to grips with. The central Structural Split section is where the division of the input into Transient and Tonal streams is handled, while the sections above and below house the Transient (above) and Tonal effects modules into which each stream outputs. The first thing to do is give the Structural Effects algorithm some guidance by setting the Source Type to match the incoming instrument - Kick, Snare, Full Drum Set, Bass, Guitar, Vocal, etc, or General if no other cap fits. The Focus slider then sets the cutoff point between what the plugin considers to be Transient and Tonal based on “stable or predictable patterns” in the signal, as discerned within analysis frames of around 40ms. Eventide’s Structural Effects algorithm separates the transient and tonal elements of a sound - the hit and body of a drum, for example - and sends each off down its own path. What makes it different to existing methods of doing the same thing, say Eventide, is that it filters the ‘shape’ of the signal rather than its frequency content over time. The upshot is that while your conventional transient shaper only gives you control over the gain and decay of each element, Structural Effects opens up more manipulation possibilities through far more precise and less linear analysis and separation - removing the transient entirely, say, or taking the snare wires out of a snare drum’s decay. The technique is likened to a sieve, sifting out the stable tonal parts of the signal from the unpredictable transients. Importantly, nothing is lost - every bit of the signal is considered either ‘transient’ or ‘tonal’, depending on the Source Type, Focus and Transient Decay settings. We look forward to seeing what other uses Eventide can come up with for Structural Effects that are of genuine creative value, beyond simply routing the two signals through more effects processors. Pushing Focus towards Tonal, for example, shortens the Transients, as an increasing proportion of each one is sent to the Tonal stream. The Smoothing dial affects the speed with which the signal switches between Transient and Tonal streams, and is used to eliminate artefacts. It needs to be handled with care, however, as it can soften transients if over-applied. Transient Decay serves a similar purpose, extending the transition time from Transient to Tonal, specifically, for essentially the same transient-lengthening you get from the decay control on a regular transient shaper. The Gain controls at the right of the Transient and Tonal Effects channels raise and lower the output levels of each (-96 to +18dB), and the Solo buttons let you hear them in isolation. The Waveform viewer shows the waveforms of both channels (pre effects and Gain) overlaid on top of the input signal waveform. With the Structural Split section turned off, both effects are applied to the whole signal, with the Focus slider determining the balance between them. The Transient and Tonal channels have their own dedicated menus of effects from which one can be loaded into each, some of them common to both channels but with slightly different control sets. With Eventide long established as one of the world’s leading purveyors of hardware and software effects, it won’t surprise anyone to learn that they’re all excellent. The Transient effects comprise Delay, Tap Delay (up to 32 taps, with variable fade up/down through the delay and rhythmic grouping), Dynamics (compression/limiting and expansion/ gating), Phaser (LFO- or envelope-modulated; 2-8 poles), Reverb and Gate+EQ (a gate followed by a three-band EQ). The Tonal effects consist of Delay (tempo syncable with high- and low-cut filters), Compressor, Pitch (three-voice pitchshifting of up to one octave in either direction for each voice), Chorus (complete with high/low shelving filter), Reverb, Tremolo (with stereo spread and envelope-triggered modulation) and EQ (three overdrivable bands). The richness, movement and sheer quality for which Eventide is known shines through with each and every one, and the controls are intuitive and well calibrated. Fission represents a generational leap for transient design plugins, expanding greatly on the core concept. Contrary to expectations, we actually found it most effective at relatively subtle blends and combinations of effects, as the results can get quite hectic at radical settings, particularly with heavily rhythmic material - although when you do find that high-intensity sweet spot, the rewards can be great. For future Structural Effects plugins, we’d like the ability to send the two streams out to separate channels in the host DAW’s mixer, allowing us to bring external effects into play. Also, one processor per stream can feel a bit restrained - a whole rack of them would broaden the plugin’s sound-sculpting potential even more. As it stands, though, Fission is a powerful, versatile and sonically superlative device with endless corrective and artistic potential. It’s one of those inspiring plugins that you want to try on everything, just to see what happens; and what happens is frequently spectacular.